The restaurant receipt that a California banker purportedly used to denigrate a waitress--while also leaving her a one percent tip--was wildly “altered and exaggerated,” according to a spokesperson for the Newport Beach restaurant where the businessman supposedly dined earlier this month. A photo of the receipt (seen at right) has gone viral in the past few days, fueled by a back story claiming that the measly tip was the imperious financier’s way of provoking a member of the lowly “99%” who was not sufficiently solicitous. 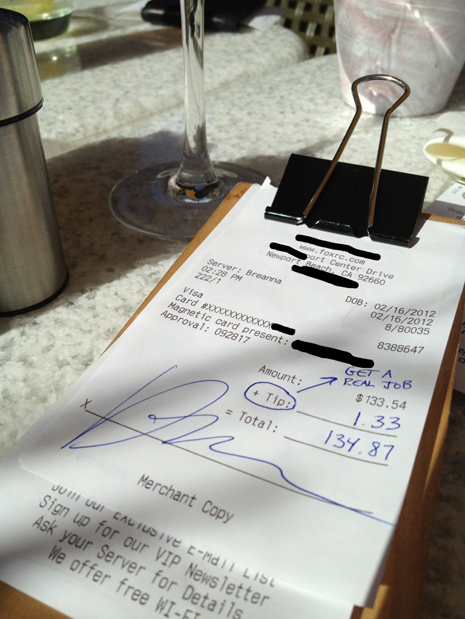 The claim about the tip--and a photo of the receipt--first appeared last week on a blog that is now offline (along with a related Twitter account). In fact, a spokesperson for True Food Kitchen in Newport Beach told TSG that the eatery was able to locate the actual “merchant copy” of the February 16 credit card receipt and it reveals that the online version has been Photoshopped. In response to e-mailed questions, spokesperson Jami Reagan reported that the original receipt does not contain the notation “Get A Real Job.” Nor does it have an arrow pointing to those words from the “Tip” line. The amount on the actual receipt is $33.54, Reagan said, not $133.54 as seen on the altered receipt. And while the tip on the online receipt claims that the server was left $1.33 (or one percent of the bill), the actual tip was $7 on the $33.54 tab.